Brenton on Sea is about 15km west of Knysna in the Garden Route. Brenton on Sea is about 15km west of Knysna in the Garden Route. Find accommodation in this coastal village or seaside resort is well known as one of the best holiday destinations in the Greater Knysna region. If you are seeking relaxed yet refined bed and breakfast accommodation in Knysna, Brenton Beach House can offer just that. A magnificent 4 star guest house in Knysna with a Cape Cod style accommodation overlooking the Indian Ocean with its long sandy beaches just 5 minutes’ walk away. Ideally situated close to the Garden Route town of Knysna, Brenton Beach House offers luxurious Guest House, and Bed and Breakfast Accommodation in Brenton-On-Sea. The Brenton Beach House is situated on the western head of Knysna. The tranquility of Brenton on sea in Knysna will certainly be appreciated by those folks wanting to recharge their batteries. Brenton Haven offers beautiful self-catering accommodation as Beach Homes or Luxury Suites. “Fall asleep with the sound of the waves crashing gently onto the beach, wake-up and step onto your private deck and enjoy the fresh air and ocean views. Escape to South Africa’s haven of nature, Brenton-on-Sea in Knysna, where you will experience the best of the world-renowned Garden Route. It is a breath taking holiday location best known for its tranquilly and long sandy beaches. Many have fallen in love with this little sleepy hollow suburb of Knysna and some even describe it has having “Champagne air”. 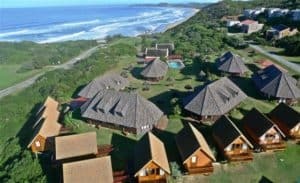 Brenton on Sea is situated on the scenic Garden Route coastline and nestles between the Indian Ocean and the hills of the Western Head of Knysna’s Estuary, a 16 km drive from Knysna. It is a breathtaking holiday location and a nature lover’s paradise with its unspoiled beaches and peaceful surroundings. Brenton is the ideal backdrop to an intimate wedding ceremony on the beach with beautiful views and dramatic sunsets. Your accommodation is situated a mere two minute walk from the 7 km beach. You will go home enriched, with unforgettable memories and great stories to tell. Surrounded by a sweeping view of the fynbos covered Goukamma Nature Reserve and faced with the greatness of the Indian Ocean expanding from East to West with Buffalo Bay in the distance, you may be forgiven for thinking that you have stepped into paradise. Brenton View consists of an upstairs and downstairs and can be rented as one unit or as two separate units, depending on the size of your group and particular needs. Fresh linen and towels are provided as well as coffee, tea and sugar. Parents with babies will be happy to know that we do have a camp cot available. From the moment you arrive, you’ll feel the warmth of the welcome at Candlewood Lodge. Perched high above the Knysna Lagoon with stunning views of the famous Knysna Heads, our award-winning, eco-friendly guesthouse offers an unsurpassed level of hospitality. Your hosts, Pat and Joan invite you to come and enjoy the peaceful and secluded surroundings under milkwood, yellowwood and stinkwood trees, where bushbuck and guinea fowl abound freely. Enjoy the birdlife at the Yellowwood Bird Sanctuary. We are 4km from the ocean – where there is a beautiful beach area – and a brisk walk from the Knysna lagoon. We offer a full English breakfast and tea/coffee facilities are available in all the tastefully furnished bedrooms. Three units are fully self catering (full gas stove, microwave and fridge). TV in all rooms. 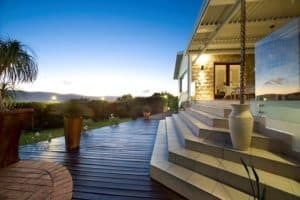 This five star Tuscan styled Villa overlooks the Knysna Estuarine bay, majestic mountains, forests and the town of Knysna from high up on the western head of the famous Knysna Heads. Perfectly positioned with north facing views over Knysna and five minutes’ drive to Brenton on Sea beach, Villa Castollini offers seclusion, privacy and a space that is therapy for the soul. Luxurious, comfortable, safe surrounds and a haven of privacy with hosts that offer genuine hospitality, the five star Villa Castollini lives by its philosophy of “Nothing is too much trouble”. Superb breakfasts follow spectacular sunrises and each day is celebrated with a reflective sunset that sets the mood for sundowners and time to take in a setting exclusive to the Villa.